Students, I've trained my camera on this object, which is barely an inch tall and weighs four ounces. It's standing on end, and even if I tip it a little sideways, it will return to an upright position. No bird lays an egg like this. Ordinary eggs won't stand on end without some help. 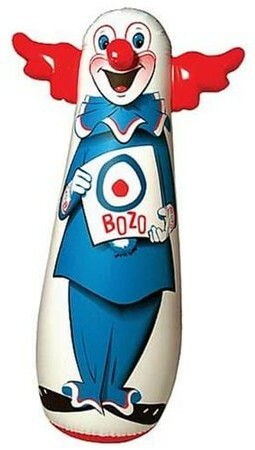 And no, this object isn't weighted on the bottom, like a bop bag that bounces right back from a punch. 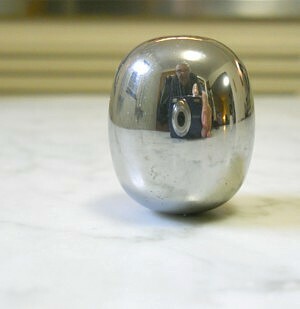 My shiny egg is solid metal, all the way through. So what's the secret? The explanation begins with some geometry. Inside the upper diagram, the red line traces an egg-like ellipse. It's the graph of the function shown below it. But what if we used a larger exponent than 2? Then we'd obtain a fatter curve, a super ellipse. 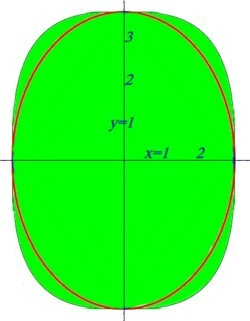 The green shape uses an exponent of 3. 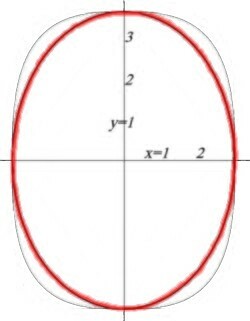 It's sort of partway between a rectangle and an ellipse, because if we were to increase the exponent even further, the corners would fill out and the shape would approach a rectangle. This fountain in the center of Stockholm is a real-life example. 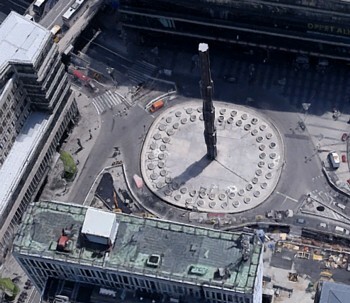 Sergels torg used to be a commonplace square. When it was redesigned in the 1950s, it could have become a commonplace traffic circle. But Danish mathematician Piet Hein suggested a pleasing compromise between the two shapes, with the curvature of the wall continuously varying. The north, south, east, and west curbs are almost-but-not-quite straight. Between them, there are no sharp corners; the curve gradually becomes tighter, then gradually eases. Hein called his shape a superellipse. He also extrapolated it into a three-dimensional superellipsoid, the Superegg. I read about all of this in Scientific American in the 1970s. 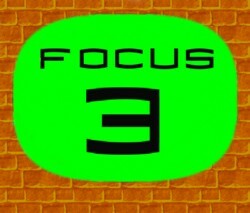 Back then, I was directing television shows on Cable TV-3 in Washington, PA. I noticed that the superellipse somewhat resembled the shape of the rounded picture tubes of that era, so when it came time to construct a backdrop for one of our programs, I plotted the function on poster board and used the shape for a logo. So back to my shiny object. How does it stay upright? First consider a child's block. Tip it a little so it's up on its right edge. As long as the center of gravity stays to the left of the edge that's in contact with the table, shown by the point of the yellow arrow, the preponderance of the block's weight will pull it back to the left. The superellipse, because it approximates a rectangle, acts the same way. 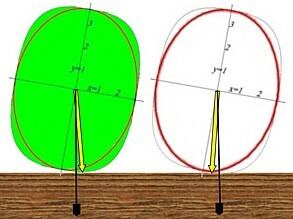 If we tilt the Supergg ten degrees to the right, the point of contact with the table (the point of the yellow arrow) rolls farther to the right than the center of gravity does. Compare it to the black plumb-bob line to see that the center of gravity remains to the left of the arrow. 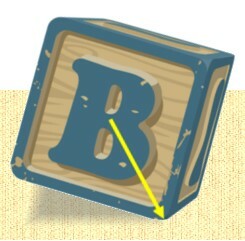 Just as in the child's block, the slightly greater mass to the left of the arrow outpulls the mass to the right, and the object falls back to the left. 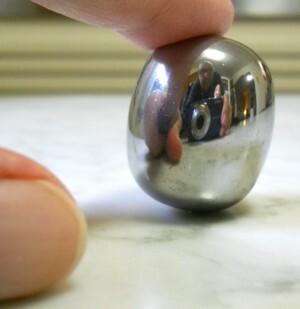 On the other hand, if we stand an ordinary elliptical egg on its end and tilt it to the same angle, the point of contact rolls to the right more quickly, moving the center of gravity to the right of that point of contact. The egg topples even further to the right.